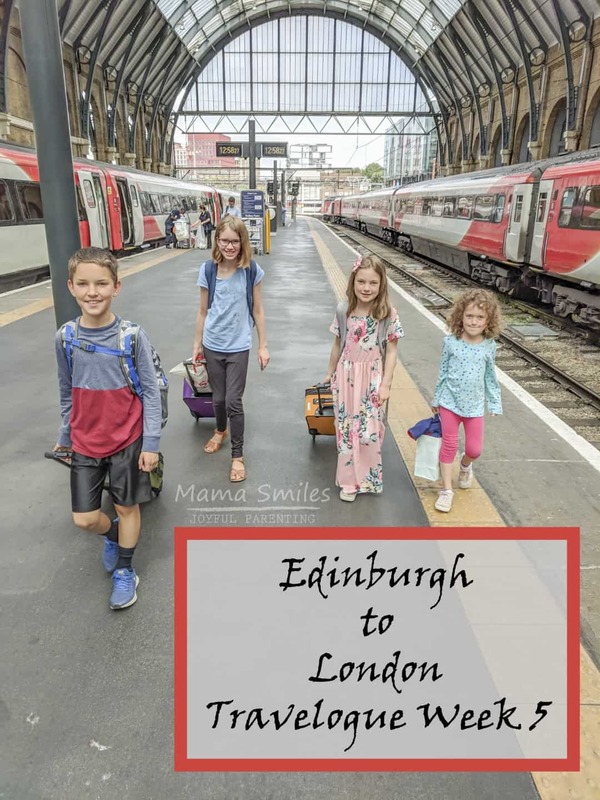 Week five of our summer 2018 travelogue takes us from Edinburgh to London by train. It was hard to say goodbye to our amazing summer in Edinburgh! During week 5 we enjoyed our final days in Edinburgh and took the train to London for the kids’ first-ever look at this incredible city. 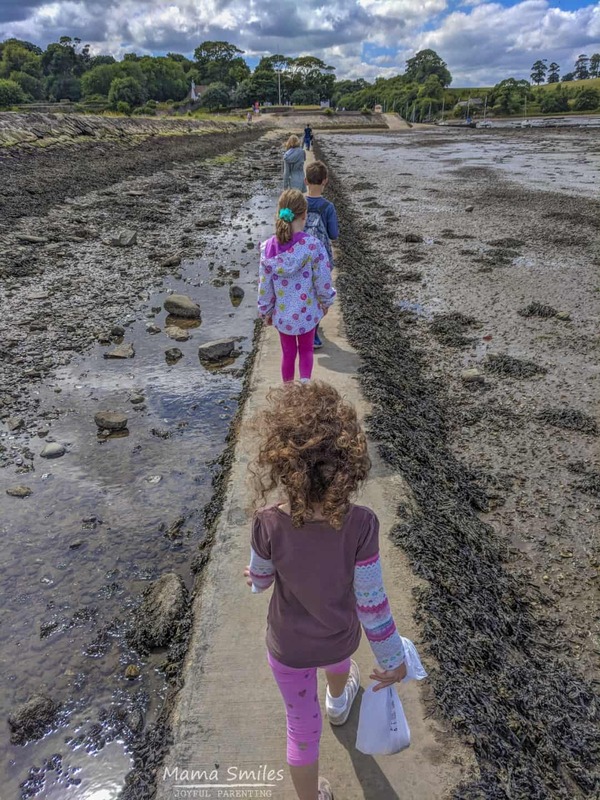 Cramond Island is fun to visit because you can walk out to it and back during low tide. The Island is also covered in beautiful flowers. A short hike to the top of the Island offers beautiful views of the surrounding area. I was careful to check the tides before going, and we picked July 16th for this outing because I knew the tide would be low in the middle of the day. The kids loved the novelty of walking on a path that is normally covered in water, and the collected some beautiful sea shells too. We’d visited Edinburgh Castle several times this summer, but we’d always missed the One O’Clock Gun. We got there early enough to snag great spots to watch – the kids sat on one of the decorative cannons to get a good view. This was a day of visiting favorites. In addition to the castle we dropped by The Elephant House Cafe and the National Museums Scotland. I took the kids to their favorite playground, and then we spent a couple ours packing up. We were very settled into our airbnb flat, and I was especially sad to say goodbye to this incredible view. A good friend from grad school days came over with her daughter in the afternoon. We fed the kids ice cream and caught up on the past 12 years of our lives. It was a great way to end our summer in Edinburgh. We got up early to catch our train to London. I love traveling by train, and this was a particularly lovely trip as we were fortunate to snag the seats with tables in the middle. The kids happily played, drew, wrote, read, and watched the scenery. Mike and I got a fair bit of work done on our laptops in between enjoying the view. Once in London we checked into our airbnb flat. It wasn’t as nice as we’d hoped, and I was especially concerned to find black mold growing in the bathroom. We decided to head out for dinner and see if it felt any better when we got home. We took the tube to Covent Garden, where we met up with my blog friends, Maggy and Laure, for dinner. It was wonderful to meet both women in real life after so many years connecting through our blogs. The kids and I met Laure at Hyde Park, and she gave us a great tour of the park. The kids especially loved meeting the resident parakeets! Laure also helped us move into our new airbnb flat, which was thankfully much better than the original one. She then took us on a tour of some of the London based Harry Potter film locations and sources of inspiration. My 12-year-old Harry Potter fan LOVED that, and the other kids enjoyed it as well. There’s nothing like having someone who lives in a place show you around. Laure helped us find a double decker bus with a rear door that would take us home, so the kids could enjoy that experience. It was a great day. The kids introduced Mike to Hyde Park this morning while I got some work done in the flat. They spent the entire morning feeding parakeets. After lunch, we took the tube to London’s West End. We walked by a theater selling last minute tickets to Motown the musical for a great price. The matinee performance was starting in three minutes. We grabbed the opportunity to take the kids to a real musical. The girls LOVED it. My son enjoyed it once he eventually forgot that he “doesn’t like musicals”. We got dinner at a gluten free food festival that was going on in Camden. The kids really liked Lily puffs. Mike woke up feeling sick, so I took the kids out of the house for most of the day. We went to Hyde Park, because that’s pretty much their favorite thing in the universe this week. I took the kids home around 2:30pm, and Mike tried taking them to the British Museum. They visited a few rooms, but the museum was packed and hot, so they came home. I had big plans for London, but so far we’ve mostly seen Hyde Park. Sometimes travel with kids is like that. London is HOT right now, and most places don’t have AC. It’s hard to drag kids on hot public transport to a hot destination, especially when what they really want is to run around outside while you sit in the shade. This summer is probably the last time all four of my kids will genuinely enjoy a place like Hyde Park. 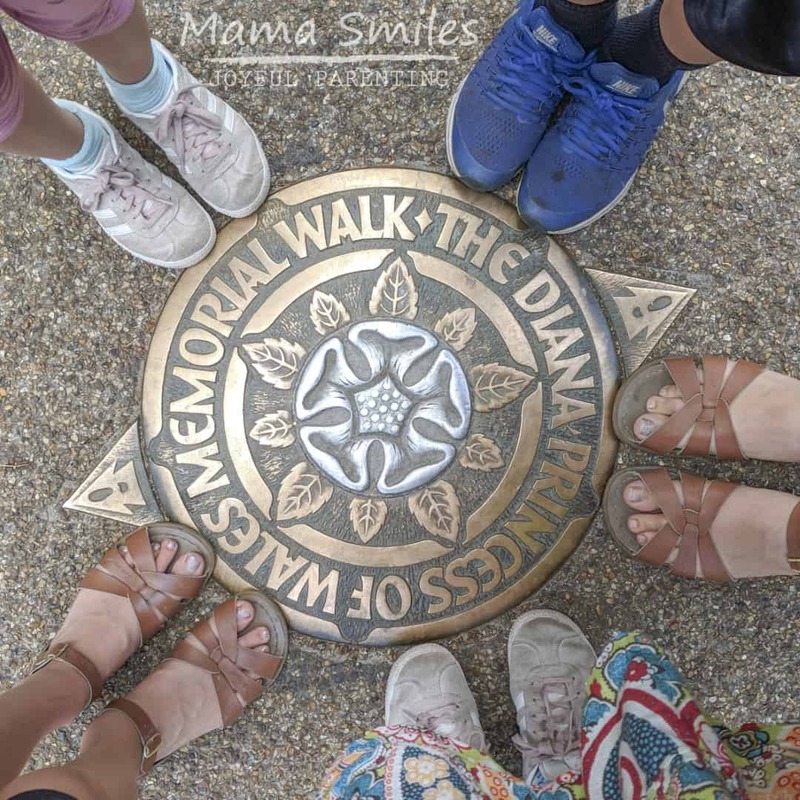 Even my oldest still enjoys the Princess Diana Memorial Playground, although not as much as her three younger siblings. They love the parakeets, and sticking their feet in the Diana Memorial Fountain to cool down. Some day I hope to bring them back to cross off more London bucket list items. For now, we’re building a powerfully positive memory of hours spent playing together in a beautiful public park. What are your favorite things to do in London? Have you ever taken the train from Edinburgh to London? What did you think? Comment below, or on my Facebook page, or by tagging me on Instagram. How cool that you got to visit London as well in addition to your stay in Scotland. I hear you on choosing stops based on kids’ interests. At the moment A is not at all interested in the museums, but she still loves playgrounds and water play. She is also NOT enjoying European heat while visiting Germany with her Dad. The heat is rough with little to no AC for a break! Ah it was SO NICE to meet up with you in London! Thank you for making the time to see me :-) I do love Hyde Park and I totally agree.. if the kids love it, embrace it. You don’t always have to tick off all the boxes… but relax and enjoy is much more important. And you know what.. 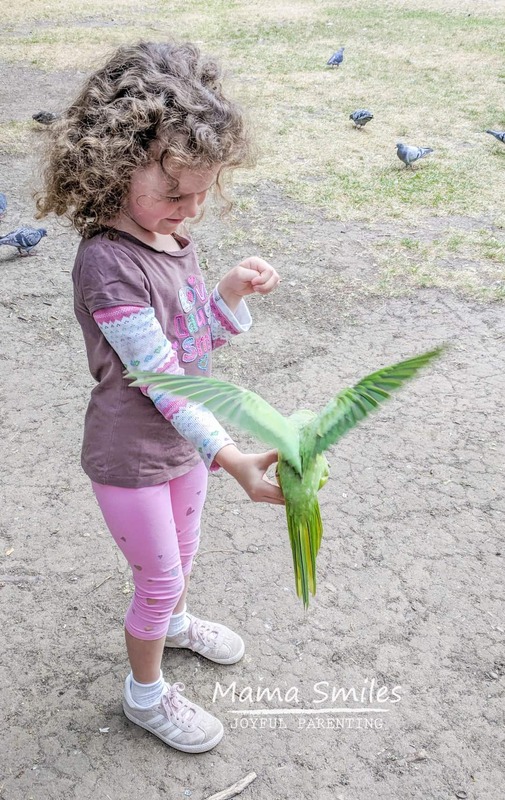 I never knew the parakeets were so tame (they are all over London including near us….) I will make it a mission to feed some when we are in Hyde Park next week!!! Any tips? They will eat apples from your hands, and if you hand them an unshelled peanut they will fly off with it, peck it open and pull the peanuts out – quite entertaining. They seem to eat regular birdseed, too. There is so much to do with kids in Edinburgh! It’s an amazing city to visit with kids. 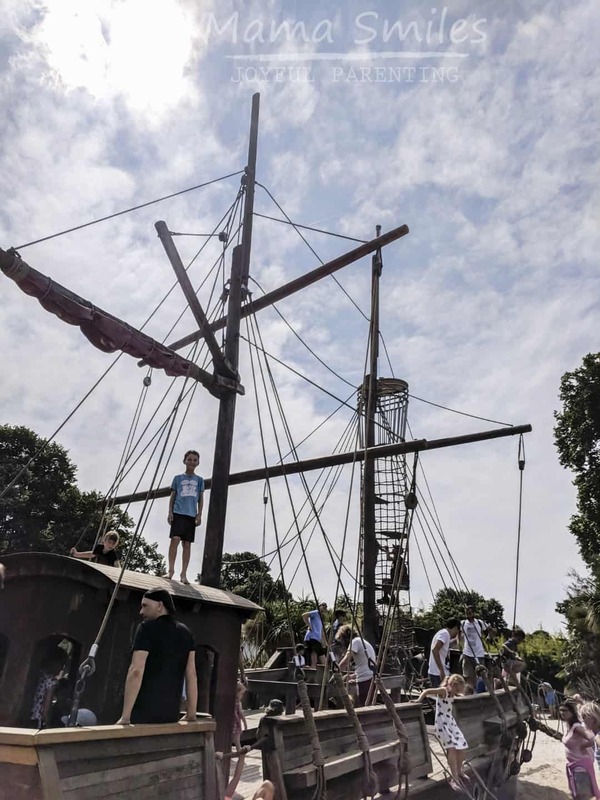 I mean if I got to go to a playground with a ship I could climb on, I’d totally want to spend a lot of time there too. I spent a lot of time at The British Museum when I was on my honeymoon, of course it was actually a little chilly (to this Texas girl) when we visited in early June, so I didn’t even realize it’s not air-conditioned. This was my first time in London in the summer, and it was exceptionally hot this particular summer. I was amazed at how many places had no air conditioning. I love your pictures and it looks like you had an amazing time. Thank you for sharing this post with us.